Close to the Sheep's Gate in Jerusalem, there was a pool, which was called the Sheep's Pool. It had round about it five porches, that is, five sets of pillars supporting a domed roof. Under this roof there lay very many sick people with various maladies, awaiting the moving of the water. The first to step in after the troubling of the water was healed immediately of whatever malady he had. It was there that the paralytic of today's Gospel way lying, tormented by his infirmity of thirty-eight years. When Christ beheld him, He asked him, "Wilt thou be made whole?" And he answered with a quiet and meek voice, "Sir, I have no man, when the water is troubled, to put me into the pool." The Lord said unto him, "Rise, take up thy bed, and walk." And straightaway the man was made whole and took up his bed. Walking in the presence of all, he departed rejoicing to his own house. 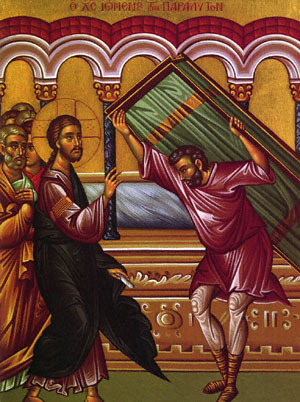 According to the expounders of the Gospels, the Lord Jesus healed this paralytic during the days of the Passover, when He had gone to Jerusalem for the Feast, and dwelt there teaching and working miracles. According to Saint John the Evangelist, this miracle took place on the Sabbath. I am grievously paralyzed in a multitude of sins and wrongful deeds. As You raised up the paralytic of old, also raise up my soul by Your divine guidance, that I may cry out, "Glory to Your Power O Compassionate Christ." Share the feast of Sunday of the Paralytic with an icon greeting ecard.